Finding the right foot- and arm-holds became easier and easier as I got nearer and nearer to the top. However, less and less light flooded in. I climbed farther for what seemed like ten minutes until a sudden flood of light entered the small space. 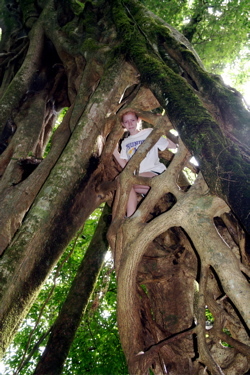 I had reached the top of the higuerón (strangler fig tree). I stuck my head out the top of the tree to see what everyone else had seen. The view to the right and left seemed the same as the one straight ahead. Since I had reached the top of the tree, the view consisted of the canopy of the bosque (forest). The view wasn’t amazingly intriguing, but it was much different than the view I would normally have walking around the bosque (forest).